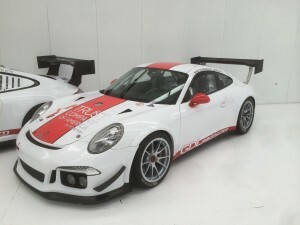 JUPITER, FL – June 18, 2014 – Accomplished, veteran racer Shane Lewis, Palm Beach Driving Club’s Resident Professional Driver, returns to the prestigious ADAC Zurich 24 Hours of Nürburgring with GDL Racing in a Porsche 991 GT3 Cup this weekend. For Lewis, this will be his sixth time racing at a 24 Hours of Nürburgring event and the 39th 24-hour race of his career. He won the event in 2010 in an Audi RS4 along with co-driver Vic Rice and has also won two 6 Hour races at Nürburgring. To prepare for Nürburgring, Lewis and the GDL Racing team tested at the Spa-Francorchamps Circuit in Belgium this week. GDL Racing is the first and only team to be running the new Porsche 991 chassis at Nürburgring, considered the toughest track in the racing world. San Marino-based GDL Racing will run three cars in the SP7 class; Gianluca De Lorenzi’s squad will bring to its world debut the new Porsche 991 GT3 Cup plus two Porsche 997 cars. The Porsche 991 GT3 Cup will be driven by Americans Vic Rice and Shane Lewis, Briton Colin White and Russian Alexey Veremenco. One of the Porsche 997 Cup S cars will be shared by Australian Paul Stubber, Swiss Kurt Thiel and Italians Dario Paletto and Roberto Fecchio. Australian Rob Thomshon, Swiss Nicola Bravetti, American Jim Michelian and Italian Sergio Negroni will be at the wheel of the second Porsche 997 Cup S.
On Thursday, June 19, GDL Racing will have its practice sessions on the track. The event continues with qualifying on Friday, June 20. On Saturday, June 21, racing starts at 4 pm. Follow Shane Lewis at www.Facebook.com/GoShaneGo and at www.Twitter.com/Go_Shane_Go. For more information on GDL Racing, visit www.gdlracing.net. Palm Beach Driving Club™ (PBDC) is a members-only club offering weekly, year-round track programs to automotive enthusiasts exclusively at Palm Beach International Raceway™ (PBIR). With four distinct levels of membership, the Club allows each driver to tailor the program to fit their lifestyle. The club’s membership is made up of drivers of all levels of experience with a desire for practice sessions on the 2-mile, 10-turn Road Course at PBIR, under the guidance of Resident Pro Shane Lewis whose numerous victories include prestigious races in the American Le Mans Series, the European Le Mans Series, the Rolex Sports Car Series, 6 Hours of Nürburgring, and the SCCA World Challenge. PBDC operates as an affiliate of PBIR and is part of the IRG Sports + Entertainment™ (IRG) family of companies. IRG also owns and operates Palm Beach International Raceway™, Memphis International Raceway™, Southwestern International Raceway™ and the International Hot Rod Association™. For more information, visit www.RacePBDC.com, call 561.622.1400 or send an email to Info@RacePBIR.com. The GDL Racing Porsche 991 GT3 Cup will be driven by Americans Vic Rice and Shane Lewis, Briton Colin White and Russian Alexey Veremenco.